I normally try to avoid hearing what other people think about a book before reviewing it—but in the case of Why I’m a Mormon, someone else’s reaction was the reason I wanted to read it. I was in a Deseret Book store in Bountiful when a man picked up a copy from the display table, noted Democratic Sen. Harry Reid was one of the 53 essayists, and said in a loud voice, “Harry Reid, huh? I wonder what he has to say for himself!” He got laughs from the other patrons. Everybody understood. What was a leader from the party of abortion and gay marriage doing in an LDS book? From that moment, I couldn’t wait to get a copy. On the flip side, the glares I got while reading it at a Salt Lake City Beans & Brews are a story for another day. 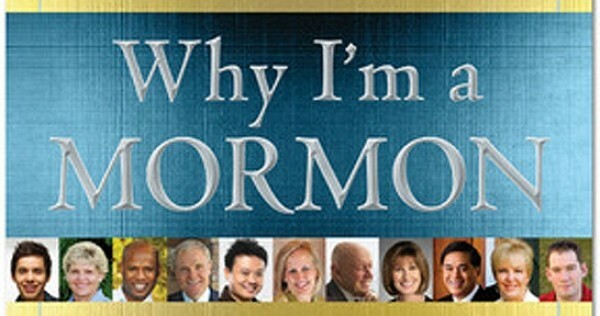 The book is one of many recent examples of how the LDS Church is moving to portray itself to the outside world as more diverse, cosmopolitan and tolerant than might be expected, while its traditional base of members—particularly in Utah—seems determined to keep the faith’s stereotypical, conservative culture. For example, the church has supported anti-discrimination ordinances protecting gays and lesbians from discrimination in employment and housing, and it has endorsed an approach to immigration that focuses on keeping families together, decrying harsh enforcement. However, Mormons in the Utah Legislature actively oppose anyone passing laws that would agree with the LDS position on either issue. It’s that tension between the traditional “peculiar people” and the church’s expansive campaign of “We’re just like you” that makes this book an interesting read during the “Mormon moment” of Mitt Romney’s presidential run. Why I’m a Mormon is the first publication of Ensign Peak, a Deseret Book imprint that a press release says is designed to introduce “Latter-day Saint topics to a broad national audience.” If the purpose of the book, edited by Joseph A. Cannon, is to show how diverse Mormons are, the effort falls short in that nearly two-thirds of the writers are white guys with an average age well into the AARP range. Without thinking too hard, where is Killers frontman Brandon Flowers, R&B legend Gladys Knight, actor Kirby Heyborne, etc.? Nevertheless, give Cannon credit for putting together a book with an umbrella big enough to include an American Indian attorney general, Mexican legislator, female champion surfer, Thai symphony conductor and, perhaps most shockingly, the U.S. Senate Democratic majority leader. Some of the entrants appear to have merely dusted off their old missionary discussions to trot out ideas that are both impersonal and unoriginal. There are too many Sunday school “the time I didn’t drink alcohol and everybody respected me for it” stories. But the reader willing to wade through those will be rewarded with some eloquent insights and interesting takes on what it means to be a Mo. However, there are also some beautiful essays that might not be so well-received at the local ward house. How would Margaret Meade Cowherd—a successful, single, childless businesswoman—be viewed at a Relief Society meeting in Sandy? What would the reaction in a Farmington fast-and-testimony meeting be to psychologist Wendy Ulrich admitting, “I have experienced periods of doubt, dissatisfaction, disillusionment and disapproval with God, Christianity and the LDS Church.” Richard Bushman, professor of Mormon Studies at Claremont Graduate University, delivers an elegant dissertation about how the Book of Mormon “helps prop open the secular frame of mind that we all inhabit.” Yet his statement that the Book of Mormon is not a “rational proof for God and religion” might be frowned upon in an Orem high priest quorum. There were, presumably, plenty of Mormons in the Utah Tea Party who shot down Bob Bennett in 2010 despite his pleading here, “How could I not be a Mormon?” (emphasis in original). One of the highlights of the book is a piece by literature and religion professor Terryl Givens, who states, “The restored gospel is a gospel of liberality and generosity. My faith encompasses and embraces them.” That’s a beautiful statement. Just don’t say it in Bountiful.